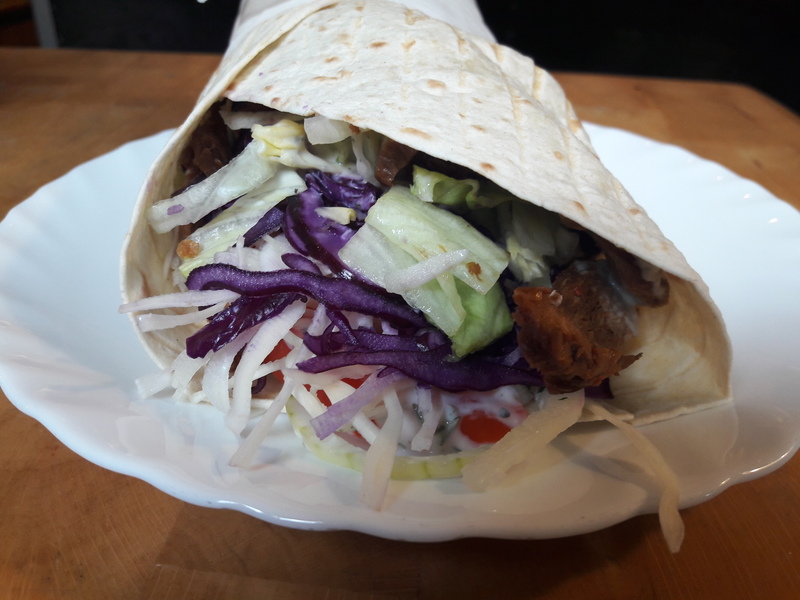 I was considering how dishes like falafel and kebabs might fit into my cuisine-fest, because I feared there might be some contention over where they originated. 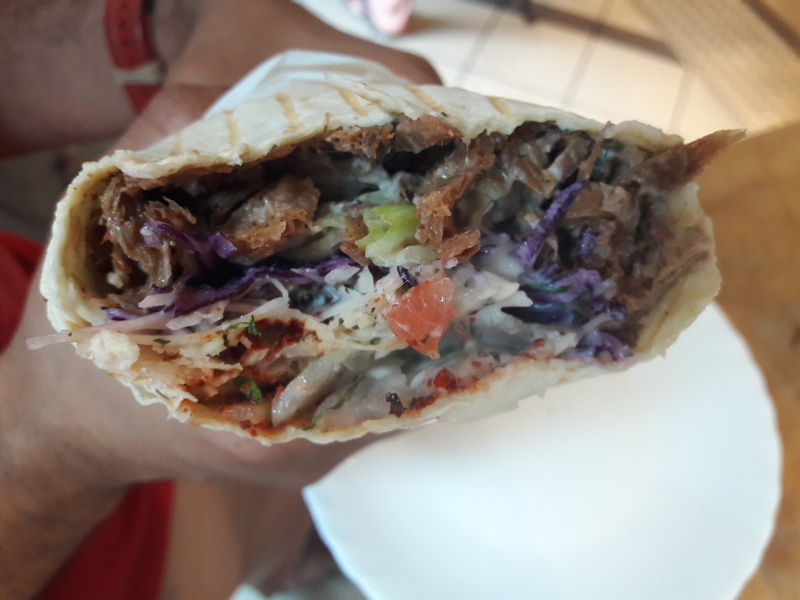 But it seems like doner definitely comes from Turkey, and this fast food, all-vegan place in Nuremberg pitches itself as a Turkish restaurant, so that’s good enough for me! Vegoner serves a few different dishes, including a goulash and a stew of the day, but we only had eyes for the doner. It’s a gigantic serving of mock meat, salad, and a choice of yoghurt or “cocktail” sauce. We were a little daunted by the latter, so we stuck with yoghurt. I have no complaints about the portion size (it was insane!) nor the texture of the meat, which was just wonderful – but I found it very bland. It didn’t seem to be seasoned at all, so maybe we should have gambled on that cocktail sauce to bring the flavour. 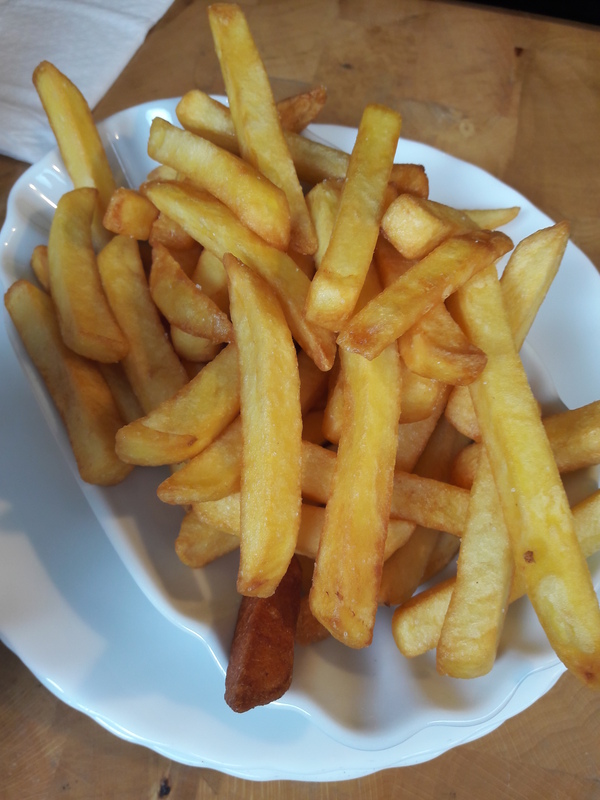 I’m not sure how Turkish chips are, but what the heck, they just go with everything! They were fried to absolute perfection, and I could have eaten a million of them…if only I’d had room! Dr HH and I ordered a portion each, and I would urge you not to repeat our mistake unless you’ve worked up quite the appetite – we left about half of them because we were just so stuffed. We didn’t even have room for the baklava, which is always a sure sign that we’ve been fed too much! Where’s your go-to vegan kebab spot? This entry was posted in Travel, Vegan Mofo and tagged vegan Nuremberg, vegan travel, veganmofo18, Vegoner Nuremberg. Bookmark the permalink. Ah yes, I’ve seen them on social media – one of the many products I’m keen to get my hands on when I’m home next! I always like Maoz, but all their Philly locations closed T__T So sad. I thought Maoz was a European thing! I’ve never even been to one before. It’s a weird chain! It started in Europe and I remember it opening the first store in the USA in Philly. It closed. There are random locations in the states.